My new best friend Jim O'Kane brings us the latest Coolest Picture Ever, a continuing series of photos I post--mostly of space stuff--that make the voice in my head exclaim "Holy Moley!" (because the voice in my head thinks in a pastiche of 1940s comic book slang). The flag! You can see the flag! To help you get your bearings, here's what we're looking at. The big white object in the photo above is the bottom half of the Apollo 17 lander in the photo below--basically the legs and gold base. The astronauts blasted off in the top half. The dark traces are footpaths or pairs of wheel tracks left by the Lunar Rover (the dune buggy in the photo below). Other new photos available at the LROC website pinpoint where the astronauts set out scientific instruments and parked the Rover, which is just off the right edge of the photo above. The image width is 102 meters, about the length of a football field plus an end zone. It's fun to compare the LRO pictures to those taken by the Apollo 17 astronauts at the time (again, see LROC). It's amazing what an elaborate hoax you can create when you've got 40 years to work on it. Of course, I'm part of the "Man really landed on the Moon nudge nudge wink wink" conspiracy, too. My role is to pose as a private citizen and make fun of people who believe in the conspiracy; writing graphic novels is just my cover story. In fact, WHTTWOT was actually written by a team of NASA bureaucrats working in a warehouse in Huntsville, Alabama. EDITED TO ADD: I just found this video of the Apollo 17 astronauts blasting off from the Moon, leaving behind the descent stage. 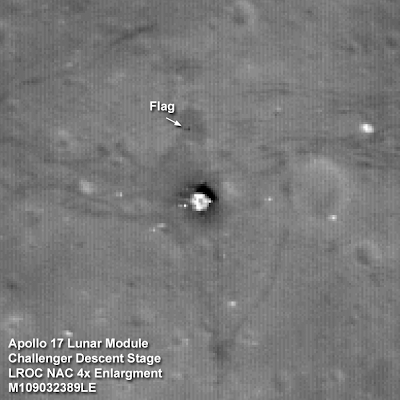 This is the very last time anyone saw it before LRO photographed it. The obvious question: Who took the video? 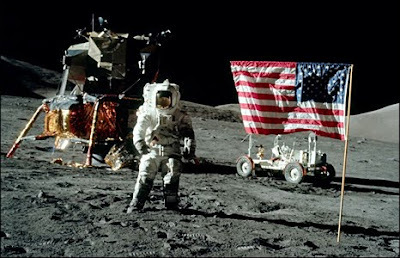 It was transmitted to Earth by a camera mounted on the Lunar Rover. So how did it tilt up to follow the spacecraft? I think (maybe Jim or someone else can confirm or correct me) it was controlled from Earth, with the second-and-a-half communications delay taken into account. Either that, or a Teamster working on a soundstage in Area 51 did it. That video only has 4 1/2 stars! I think we should go back and do it again -- maybe in HD this time -- to get 5. Dude, if you use pastiche in a post, you must also use montage, melange and cliche. No skimping on froggy talk. (that's Ed in the bottom photo, on the right). If you're pleased with that answer, perhaps you would consider answering a question of mine. It seems that you are able to generate some pizza money by doing work that might be described as scientific or technical copyediting, and I am interested in how one gets started doing that. I have a Ph.D. in physics, so the technical end is covered, and I'm also an enthusiastic and reasonably skilled writer. By all accounts, I am a competent and compulsive copy editor; you and I share the same favorite punctuation marks, and I can correctly choose between "fewer" or "less." At times, I amaze my more easily amazed colleagues by consulting a journal's style guide for advice on abbreviating some of the stranger units out there. It therefore seems to me that if I come to a time when I'm not doing full-time research, and am looking for something to do part-time, I might be able to generate a pizza or two for myself in technical editing. Do you have any advice? We -- I -- have a deep need for exciting stories about where we're going, and for a wider perspective than our everyday concerns on the Earth. The dream of a better world is one worth keeping. But thank you, thank you, thank you for writing this wonderful book! Namowal and Sherwood: Coolness indeed! I'm ready to go get better pics and videos if NASA will give me the camera and a ride. Hercule: Oui. That's all I got. Anon Apollo Baby: Thanks so much for the ID of Ed Fendell! I love learning about people like that, working on the periphery of one of humanity's greatest adventures. My own career in science writing has been so unique as to be unreplicable. You've obviously got a good background for it, and there is a market for the skill: a lot of people know writing and a lot of people know science, but not many know both. In general, I think most universities, laboratories, research institutions and so forth handle their writing needs in-house (although I've done some work for folks like that, and you might have some contacts from your own university experience). Starting on your own from scratch with no experience or contacts would be very, very tough. But there are many subcontractors--often small businesses with two, three or a dozen writer/editors--who do that kind of work. I got started at a company like that before going out on my own. I think that's your most likely avenue: offer your services to one of them. To figure out who they are, read the professional journals and trade press in whatever scientific niche you're interested and see who writes those articles (or who is mentioned in an acknowledgement, since you'll typically ghost-write for an industry expert who gets the byline). If you see the same name pop up more than once, that's someone you want to contact. I'd imagine they'd be thrilled to have a Ph.D on tap, assuming you can indeed write and edit. If you're good, clients will recommend you to other clients and you're off. Feel free to contact me privately anytime. You want NASA to give you a camera and a ride? I'd settle for either one, but if they just give me the latter, I'd provide the former at no charge. Anyway, the research job is doing the trick for me presently, but you have given me a few good ideas for where to start should that situation change. I might take you up on your kind offer for more information if I get serious. I'll leave you with another good photo of "Captain Video" at work. It's on page 110 in case this link doesn't do what I expect it to. Late to the party as I'm hip-deep in finals, but thanks for the mention! There's a great sequence of Ed Fendell's story in the final episode of HBO's "From the Earth to the Moon". Can't find the scene on Youtube but the DVD set is a must-have for the space junkie.